The Department for Natural Resources, Wildlife Resources Division, of Georgia lists 23 birds of prey that reside throughout the state. Raptors make up less than 10 percent of the bird population in Georgia, but, since both nocturnal and diurnal species live in the state, you can see circling Mississippi kites during the day, and at nightfall you can hear the call of the great horned owl. Most raptors do not migrate and can be spotted throughout the year. The great horned owl and its smaller lookalike, the screech owl, can be found in most rural areas. These two raptors feed on small mammals and rodents. 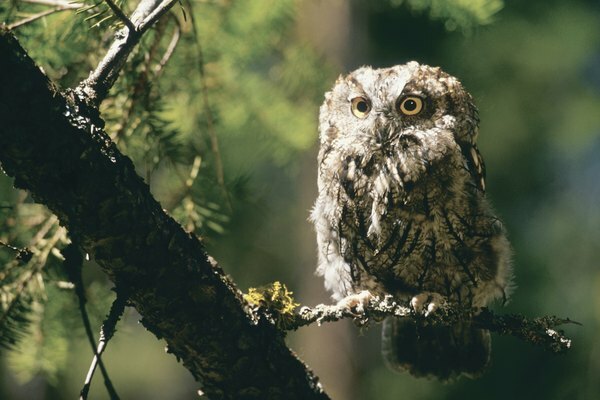 The screech owl measures a mere 8 inches, the smallest owl in Georgia, while the great horned owl can have a staggering 60-inch wingspan. Both these owls prefer the hollow of a tree to nest in. You can also see barred owls and barn owls. Barred owls have a very recognizable call that is said to sound as if it is saying, “Who cooks for you?” Barn owls, which has a white heart-shaped face, are elusive, and as their name suggests, they like to roost in barns where field mice and rats make an easy meal. Owls that are more rarely seen in Georgia include the snowy owl, the long-eared owl, the short-eared owl and the northern saw-whet owl. Hawks in Georgia prey on everything from insects and frogs to small mammals like the rabbit or field mouse. This group of raptors has hooked beaks, very keen eyesight, and shark talons for seizing prey. Hawks prefer live prey and hunt during the day. The red-tailed hawk is the largest hawk that calls Georgia home, but you may also see the broad-winged hawk, sharp-shinned hawk, red-shouldered hawk and Cooper’s hawk sharing the skies. The rough-legged hawk or northern goshawk are less commonly observed. 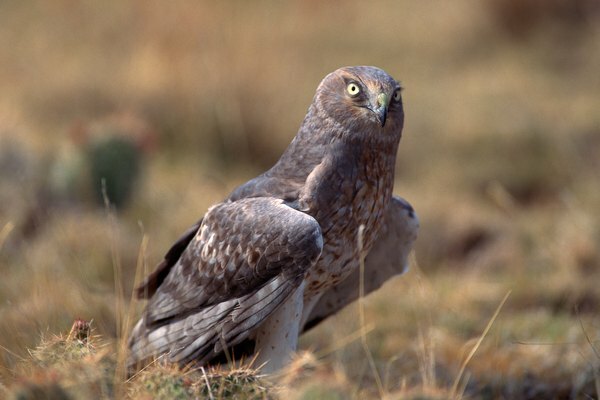 Another hawk-like bird is the Northern harrier, which flies slowly through the sky in search of rodents. Three different falcons can be observed in Georgia. The small and colorful American kestrel is very colorful and be seen perched on utility lines watching activity below. 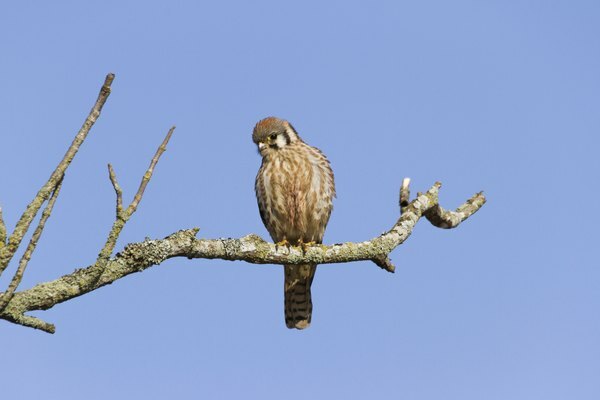 Merlins, also called pigeon hawks, are native to Georgia and are approximately the same size as their cousin, the American kestrel. Merlins grow to a height of 9 to 12 inches. Peregrine falcons share the air, taking plunging dives for their prey that can reach speeds of over 200 miles per hour. 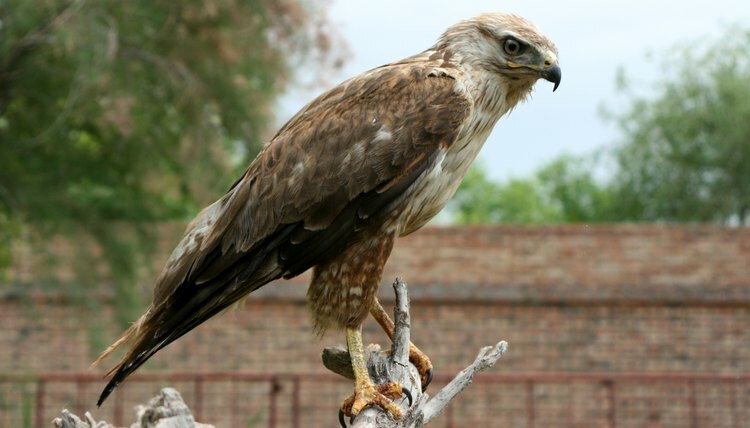 Two species of kites are also residents of the state. Swallow-tailed kites and Mississippi kites have long pointed wings and fly very gracefully. 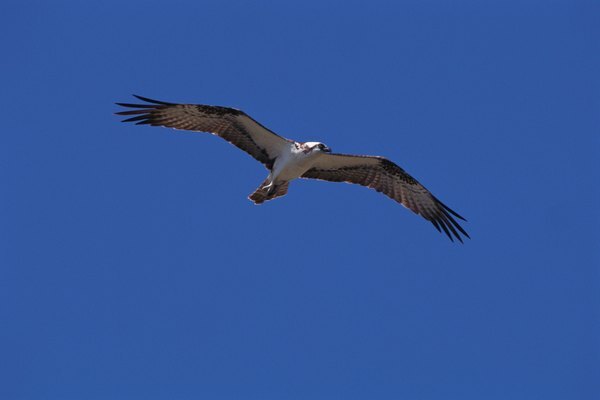 The Osprey and the American bald eagle are two of the largest raptors native to Georgia. Both of these raptors are fishing birds that feed primarily on live fish. Finally, finishing off the list of birds of prey that call Georgia home, is the Golden Eagle. This awesome raptor has a wingspan of up to 7 feet but weighs only 15 pounds, according to the Associated Electric Cooperative, Inc.
Loren Estes became a licensed wildlife rehabilitation professional for the Kentucky Department of Fish and Wildlife in 1998. She cares for wildlife native to Kentucky. In her spare time, Estes also lectures and volunteers for various nonprofit organizations involved in animal care and adoption.